You know when you're done decorating a room but it feels kind of bland. There is nothing really wrong with it but you just feel like that 'wow factor' is missing. Well, that used to be the case with our hall. It was the first room I bought furniture for when we moved in 5 years ago and I just wanted to fill that empty space (big mistake!) and I settled for something that was just ok. I'm annoyed with myself that I didn't take a before picture but just to give you an idea, our old shoe storage was a black gloss hall tidy from Next. Trust me, it was everything but tidy! It was such a mess and the gloss surface scratched so easily that after a year I really wanted to replace it. So for a while now I've been keeping an eye out for the perfect console table. I wasn't sure what style I should go for until I saw this marble console table from Swoon Editions. I love marble and the minimalist design convinced me to go for it (I also got £20 off my first order which was pretty nice!) I ordered the table online, so I was a little nervous what it was going to look like. Luckily it was even more beautiful in real life! I'm so impressed with the quality and the craftsmanship. It's real marble which just looks so luxurious and I can't help touching it as I walk past. If you're not familiar with Swoon Editions already, go and have a look at the website. They have so many amazing items at affordable prices which means I'll be probably (ok, definitely) shopping with them again. Remember though, they are all limited edition pieces, so if you really love something don't leave it too late or chances are it will be gone! 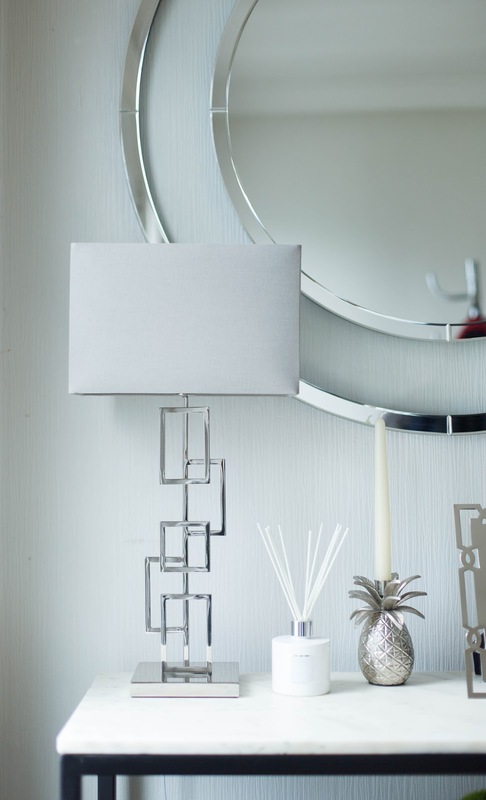 The Cassius console table has definitely transformed our hall, but you do need to accessorise it, or it can look a bit bare and out of place. 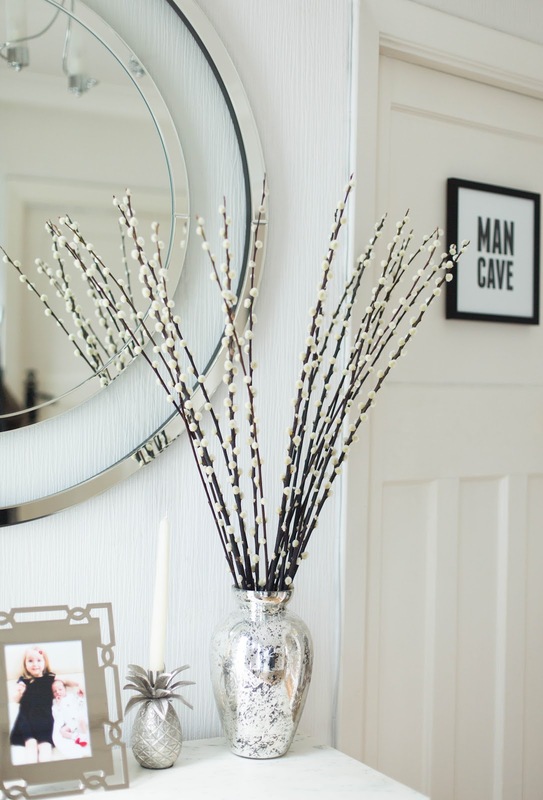 I did a piece for Laura Ashley few months ago (read it here) and I really loved how the elegant Laura Ashley accessories gave our new table a timeless, chic look. 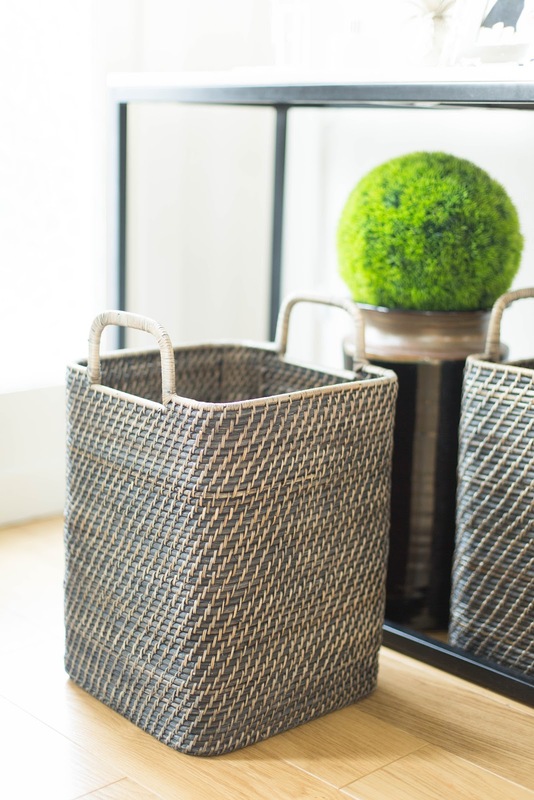 The West Elm Storage Baskets are ideal for a hall and we use them mainly to store our shoes. You could easily fit in 10 pairs in each basket but I try not to overfill them. 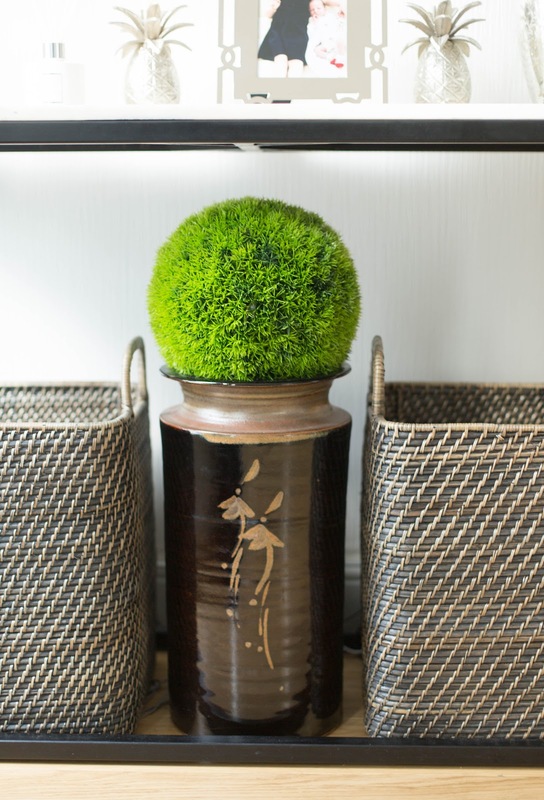 I picked up the Artificial Buxus from Homebase and decided to place it in the large vase. Don't you just love using artificial plants indoors? I wouldn't over do it but there's no harm in having one or two dotted around the house, right? One thing I hate about halls is that it's pretty hard to make them look tidy and organised all the time. Often space is also limited which doesn't give you too many options, does it? That's probably why I decided to go for a coat stand. It's from Next (discontinued) and although it does the job, I find that coat stands aren't that practical. 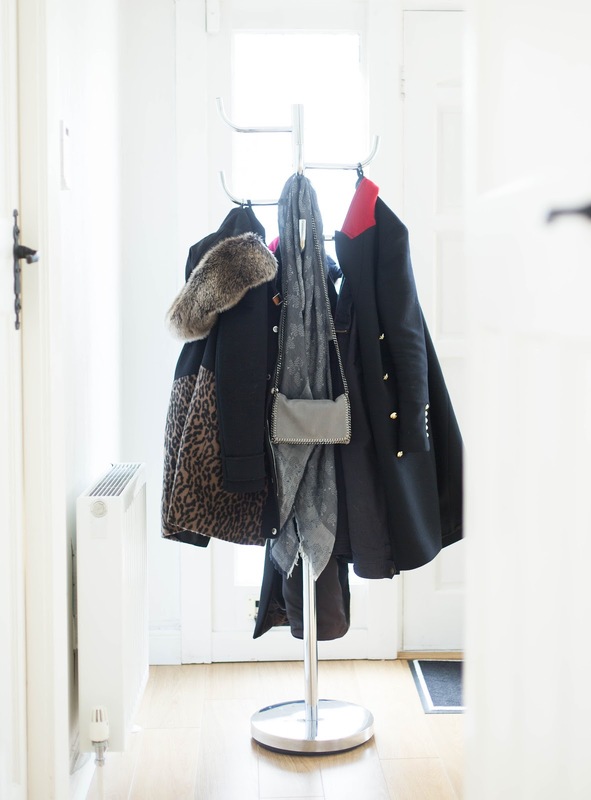 You need to make sure that you place coats on the rack evenly or it will become very unstable. Plus it won't look good if it's covered under a pile of coats! But having said that, we've had it for 5 years and I'm not planning to replace it anytime soon. Perhaps it was the perfect solution for our smallish hall after all. 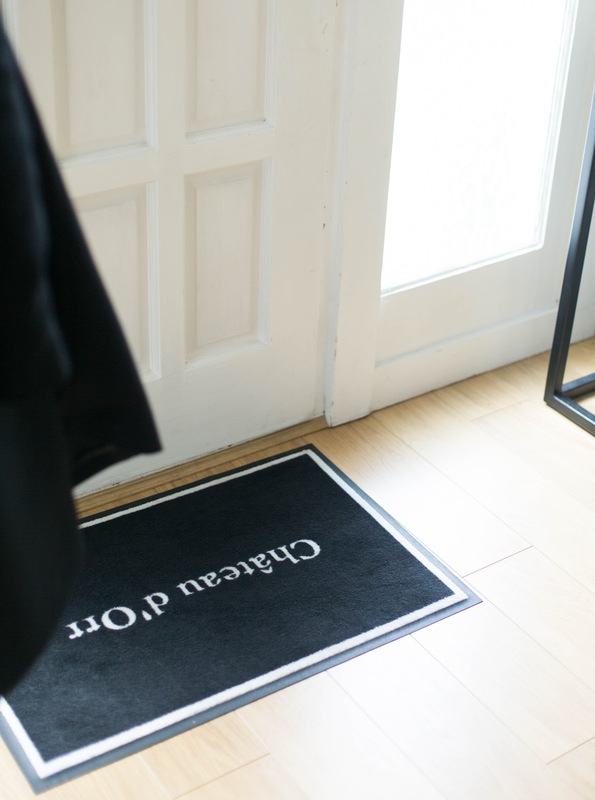 I have this thing with doormats. I've been obsessed with them as long as I can remember. I also think that hall is one of the most important rooms in the house, because whether you like it or not, people will judge you based on what your hall looks like. And often it's the only room they will get to see! I ordered our door mat from mymat.co.uk. You can use one of their templates, but the design options are quite limited so I designed my mat in Inkscape (any graphics software will do). You can even get one of their designers to create a design for you (at an extra cost). It's a bit cheesy but I love it! The man cave door sign is the latest addition to our hall. 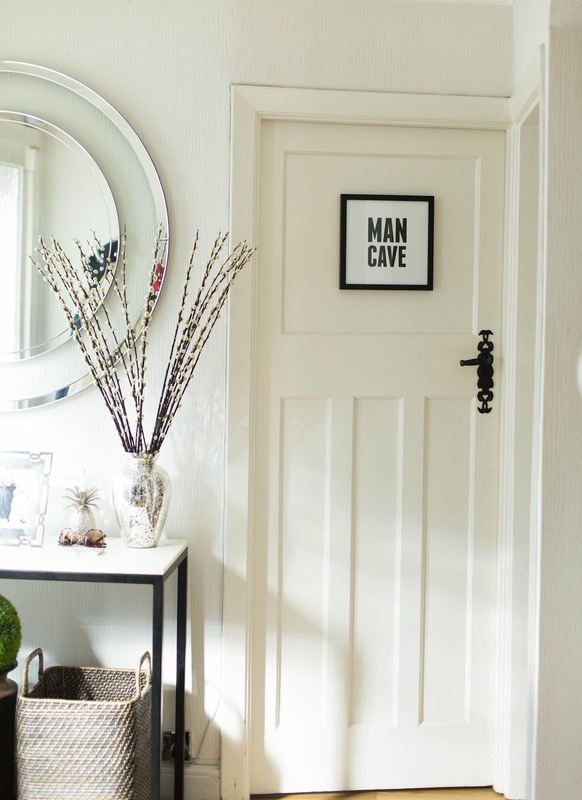 I got it for my husband for Valentine's and although I looked at quite a few different hanging door signs, I thought a simple black framed print will suit the space best. The print came without a frame so I had it framed in our local framing shop. They did a great job and we used Command Strips to hang it up so there would be no damage to the door. Most importantly my husband loves it, almost as much as he loves his man cave (and the fact that he has a room to escape to from 3 lively women). 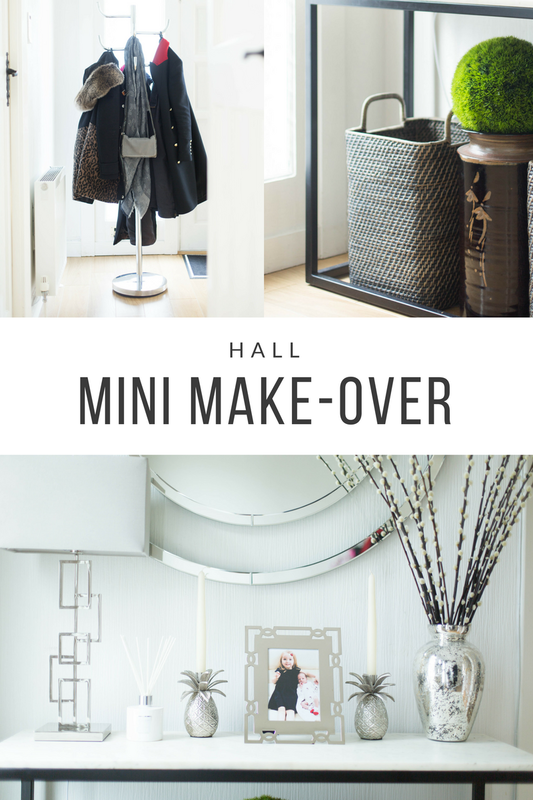 So that's it for our hall mini make-over. We will be doing a proper make-over (remove old wall paper, paint the walls, new door etc) in the next few years, but I'm so glad that my hall refresh turned out the way it did. Obviously I cannot wait to get rid of the old wall paper (got to love these old 1930s houses - what were people thinking?) but once we remove the wall paper in the hall, we have to do the entire landing and the upstairs as well - so it's quite a big job. Also, our youngest daughter still needs safety gates which are drilled onto the wall, so in many ways, it's sensible to leave this project last. But for now, I'm happy with our hall, with the new furniture and the pretty accessories. I'd love to know what you think? Do you think first impressions matter? * Some of the items in the post have been gifted to me.